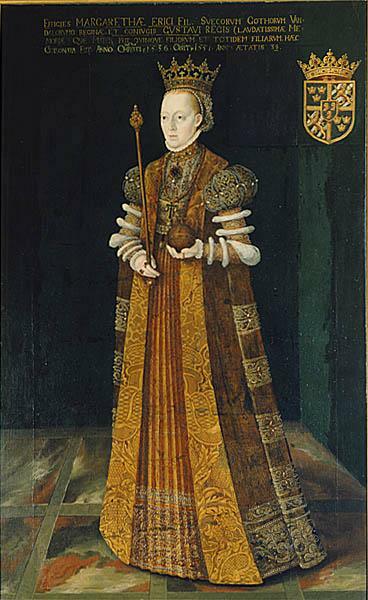 Margareta Eriksdotter Leijonhufvud was one of the most important Swedish rulers during the 16th century. She was King Gustav I Vasa’s second wife and as queen she exercised responsibility for elements of Swedish policy-making for just over a decade, sometimes during turbulent developments like the Dacke War, a peasant uprising. Margareta Eriksdotter Leijonhufvud’s date and place of birth remain uncertain but it is likely that she was born around the turn of the year 1515-1516, possibly on Loholmen in Lake Anten, Västergötland, where her family had a property. Her parents were Ebba Eriksdotter Vasa and the privy councillor Erik Abrahamsson Leijonhufvud. Margareta Eriksdotter Leijonhufvud was the middle child in a family of six siblings. An older sibling had died in infancy before Margareta Eriksdotter Leijonhufvud was born. The rest of the children survived into adulthood and several of them came to play significant roles within the history of the Swedish kingdom. When Margareta Eriksdotter Leijonhufvud was five years old she lost her father Erik in the so-called Stockholm Bloodbath, where many men of the Swedish nobility were executed by their Danish overlord. Her mother, Ebba Eriksdotter (Vasa), did not remarry and became the head of their family. She and her children spent a lot of time on Loholmen in the ensuing years. King Gustav I Vasa was one of their guests and he noticed the significantly younger Margareta Eriksdotter Leijonhufvud and began to court her. As a teenager she was small, fair and slight. Skeletal analysis has revealed that she was barely 155 cm tall and had delicate features. Margareta Eriksdotter Leijonhufvud may already have been engaged to Svante Sture, a young nobleman, when she first met King Gustav. Although Svante Sture may have had to endure rejection, he did go on to marry Margareta’s sister Märta instead. Through the sisters’ close relationship the Sture family gained better access to the royal Vasa family. Margareta Eriksdotter Leijonhufvud had just turned 20 when she married Gustav Vasa and became the king’s second wife. The wedding took place on 1 October 1536. The king may have chosen Margareta Eriksdotter Leijonhufvud as a result of the poor state of Sweden’s reputation abroad. King Gustav I Vasa had difficulty in finding a princess from the continent whose parents were willing to let their daughter marry the king of Sweden and so he turned to a Swedish-born noblewoman instead. Margareta Eriksdotter Leijonhufvud turned out to be a clever choice. She expertly fulfilled her role as royal consort and the couple appear to have had a happy marriage. Over the ensuing years they had ten children: Johan, Katarina, Cecilia, Magnus, Anna, Sofia, Elisabet, Karl, and two boys who died young. Not only did Margareta Eriksdotter Leijonhufvud survive one pregnancy after another but she also supported, and co-reigned with, her husband throughout her period as queen. Margareta Eriksdotter Leijonhufvud, by all accounts a particularly competent individual, began to function as a link between Swedish subjects and their king from an early stage of the marriage. People often approached her instead of the king when they wanted to present their opinions or a petition, knowing full well that she could influence the king and convey their messages to him. The surviving sources reveal that she both pushed through decisions taken by King Gustav I Vasa and that she herself had the authority to make her own proposals known to Swedish subjects. During the Dacke War of 1542-1543 she was responsible for discovering potential instigators of rebellion. The king asked his wife, in a letter dated 26 February 1543, to send spies disguised as peasants to the Södermanland countryside in a quest to discover what the general mood was in the kingdom. Margareta Eriksdotter Leijonhufvud’s political activities were most obvious in domestic matters, but she also played a role within the sphere of diplomacy and international relations. The best example of this is perhaps a letter of thanks which she wrote to Margaret of Navarre, sister of the French King Francis I. Whenever King Gustav I Vasa was absent Margareta Eriksdotter Leijonhufvud was in charge. The king, a cautious and suspicious regent, trusted his queen. In 1542 she was placed in command of Stockholm Castle, which meant that – were the king to die – she would run and manage the castle until the heir apparent, Prince Erik, was old enough to take over. Margareta Eriksdotter Leijonhufvud was also placed in command of the castles of Läckö, Gripsholm, and Stegeborg, all of which occupied strategic positions in the kingdom. She also was appointed as Prince Erik’s guardian in the case that King Gustav died. Margareta Eriksdotter Leijonhufvud died in 1551 at Tynnelsö farm in Södermanland as a result of an illness. She had enjoyed a very positive reputation. According to her brother Sten she was “very blissfully talented”. During her lifetime she had been very generous and in her will she donated rich gifts to various religious institutions, schools, and hospitals. Her many donations to the Vadstena nuns indicate that she remained true to the Catholic religion within which she had been brought up despite the increasing spread of the Reformation across Sweden. She is buried at the Uppsala Cathedral beside King Gustav I Vasa. There are no known contemporary portraits of Margareta Eriksdotter Leijonhufvud. In 1556 the Dutch artist Johan Baptista van Uther completed a full-length portrait of her in which she is dressed formally, bearing a crown and sceptre as a symbol of a person of power. Margareta, drottning , www.skbl.se/sv/artikel/Margaretadrottning, Svenskt kvinnobiografiskt lexikon (article by Katarina Harrison Lindbergh), retrieved 2019-04-24.